Today is Thursday, Oct. 24, the 297th day of 2013. There are 68 days left in the year. 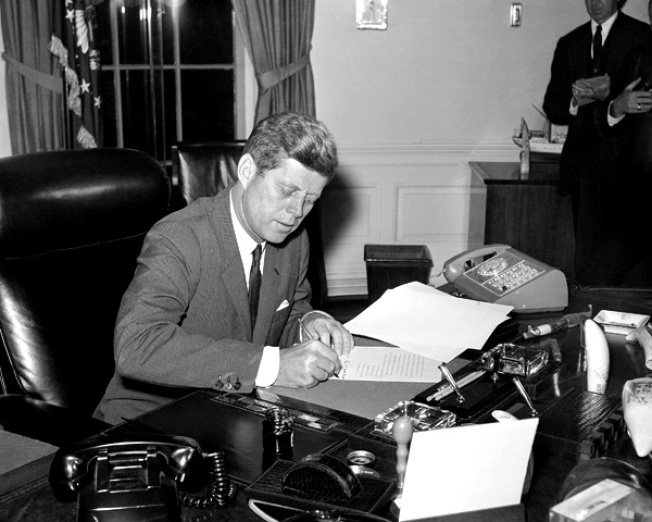 U.S. President John F. Kennedy signs the Proclamation to establish a naval arms blockade around Cuba. The Chief Executive signed the order at his desk in the White House at 5pm EDT, on Oct. 23, 1962. It becomes effective at 10am EDT, on October 24. On Oct. 24, 1962, a naval quarantine of Cuba ordered by President John F. Kennedy went into effect during the missile crisis; the blockade was aimed at interdicting the delivery of offensive weapons to the island. In 1537, Jane Seymour, the third wife of England's King Henry VIII, died 12 days after giving birth to Prince Edward, later King Edward VI. In 1901, widow Anna Edson Taylor became the first person to go over Niagara Falls in a barrel. In 1939, Benny Goodman and his orchestra recorded their signature theme, "Let's Dance," for Columbia Records in New York. Nylon stockings were first sold publicly in Wilmington, Del. In 1972, Hall of Famer Jackie Robinson, who'd broken Major League Baseball's color barrier in 1947, died in Stamford, Conn., at age 53. In 1991, "Star Trek" creator Gene Roddenberry died in Santa Monica, Calif., at age 70. In 1992, the Toronto Blue Jays became the first non-U.S. team to win the World Series as they defeated the Atlanta Braves, 4-3, in Game 6. In 2002, authorities arrested Army veteran John Allen Muhammad and teenager Lee Boyd Malvo near Myersville, Md., in connection with the Washington-area sniper attacks. Ten years ago: Three Concordes swooped into London's Heathrow Airport, joining in a spectacular finale to the era of luxury supersonic jet travel. International donors pledged more than $33 billion for Iraq's reconstruction in the next four years -- nearly two-thirds of it from the United States. Tiger Woods matched the 55-year-old standard set by Byron Nelson by making the cut in his 113th consecutive PGA Tour event. Se Ri Pak became the first woman to make the two-round cut in a men's golf tournament since Babe Zaharias in 1945. Five years ago: Singer-actress Jennifer Hudson's mother and brother were found slain in their Chicago home; the body of her 7-year-old nephew was found three days later. (Hudson's estranged brother-in-law has been arrested in the killings.) A Russian Soyuz capsule touched down in Kazakhstan after delivering the first two men to follow their fathers into space, a Russian and an American, to the international space station. One year ago: The San Francisco Giants took the first game of the World Series, 8-3, over the Detroit Tigers, as Pablo Sandoval became the fourth player to hit three home runs in a World Series game. Hurricane Sandy roared across Jamaica and toward Cuba, before taking aim on the eastern United States. On a 40-hour tour of a half-dozen battleground states, President Barack Obama predicted that a second term would bring quick agreement with Republicans to reduce federal deficits and overhaul immigration laws. Today's Birthdays: Football Hall-of-Famer Y.A. Tittle is 87. Rock musician Bill Wyman is 77. Actor F. Murray Abraham is 74. Movie director-screenwriter David S. Ward is 68. Actor Kevin Kline is 66. Former NAACP President Kweisi Mfume is 65. Country musician Billy Thomas (Terry McBride and the Ride) is 60. Actor Doug Davidson is 59. Actor B.D. Wong is 53. Rock musician Ben Gillies (Silverchair) is 34. Singer-actress Monica Arnold is 33. Actress/comedian Casey Wilson is 33. Rhythm-and-blues singer Adrienne Bailon (3lw) is 30. R&B singer-rapper-actor Drake is 27. Actress Shenae Grimes is 24. Thought for Today: "Three passions, simple but overwhelmingly strong, have governed my life: the longing for love, the search for knowledge and unbearable pity for the suffering of mankind." -- Bertrand Russell, English philosopher (1872-1970).